This page contains free reference and learning resources for download, aimed at helping you to develop your filmmaking skills using Moviestorm. 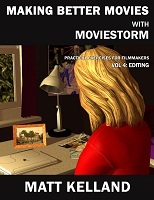 A range of self-guided e-books, with exercises designed to improve filmmaking skills using Moviestorm. This book, designed for self-guided study, enables students to develop their skills through filming scenes in several different ways. Previsualisation is a powerful pre-production technique that has the potential to reduce production and post-production costs and also help you make better movies. Some proponents of previsualisation claim that this technique can reduce shooting time by up to 50% and cut post-production time by up to 25%. Identifies two different approaches to animatics and how to choose which is right for you, then explains how to generate your animatic with Moviestorm, and convert it into a storyboard.